A medium tank with an oscillating turret and automatic loading. Developed on the basis of experimental medium tank T42 in mid-50s. The vehicle never entered mass production. The T69 medium tank is similar to the French AMX 13 90. Although it is a bit slower, it has more armor and more firepower. This increases the chances of players bouncing rounds off of it, allowing some players to take on tier 9 mediums in this tank. However, it only holds 4 rounds in a magazine, meaning you have to pick your fights. Turret is highly sloped and will bounce some shots. Front hull is surprisingly strong. Play from the rear, always in support, and always with support. Use your excellent view range to your advantage. You are an excellent finisher. As mentioned above, the autoloader reloads quite quickly between rounds - about 2 seconds - so with a full magazine you can fire repetitiously. The magazine holds 5 rounds on the 76mm, but only 4 rounds on the 90mm. The 76mm's magazine will reload in roughly 18 seconds - depending on your crew skills, equipment, and consumables, of course. The 90mm takes longer to reload - naturally - at around 24 seconds. To a player wanting a change of pace, one can try the 76mm gun even if they already have the 90mm gun. With the perk Dead Eye and the fact you're shooting more shells you will find engines and modules will constantly feel the pain, and scouts be much easier to dispatch. Naturally, Vertical Stabilizer and Gun Laying drive are even more effective in this scenario. Gun elevation is not great, but the depression is surprisingly good, which, when coupled with the high overall height of this tank, it can be used hull down in the right terrain. In its stock form, the T69 is a very slow medium with worse firepower than the light tank before it, so players can choose to go 2 routes for their first upgrade. T69 was a US Medium tank developed in the period from 1953 to 1955. The U.S. in the late '40s and early '50s was very interested in the development of French tanks with oscillating turrets. 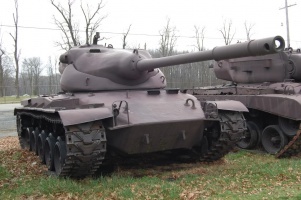 And so, it was not long as the Americans got hold of the 2nd experienced French AMX-13 tank. But even after a U.S. study pursued a series of setbacks for the creation of such tanks and then they turned to the French experience. The United States has achieved its greatest development in the creation of medium tanks with oscillating tower and the first of them was armed with a 90mm gun, T69, use the chassis experienced tank T42. The French tanks automatic loader was introduced into the feed gap of the tower, which means that you need to recharge to be outside of the tank. In combat conditions, it meant the conclusion equipment from the combat zone to recharge, which means literally a single application of a tank in combat. U.S. went ahead and fixed this huge flaw placing the autoloader ammo drum under the gun of the tank, allowing relatively quick recharge tools without leaving the safety of the tanks hull. Tanks main armament, T175 90 mm gun was essentially a version of the TJ39 900 mm gun installed on M36 Jackson and M26 Pershing, but with some assembly changes applied to solve the problem with the imposition of rollback. The autoloader could accommodate up to eight (8) conical shells, and could feed the gun at the rate of around 18 rounds per minute. After the shot, the cartridge was automatically ejected through a designated hatch on the turret. 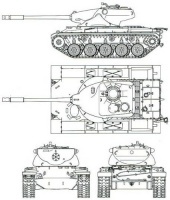 The layout of the tank - a classic. The crew consisted of 3 people. The loader was placed on the left side of the cast turret and was responsible for refilling the drum once empty while the gunner was located right in front of the tower, improving the comfort of using periscope sight. The engine power of 500 horses allowed max speed of 51 km\h. Suspension was built around individual torsion bar with hydraulic shock absorbers. From 1955 to 1956, the tank was tested at the Aberdeen Proving Ground. The result was disappointing and revealed serious problems and failures of the automatic loader. Unfortunately, problem of stabilizing the rocking mechanism of the tower was never solved, and it eventually led to cancellation of the projects. Experience gained on T69 was used on all other experimental designs with oscillating turret. This page was last modified on 23 August 2014, at 01:21.